With a career spanning over 30 years, Icehouse has continued to delight millions with their music, well-known and loved by audiences across generations. ICEHOUSE has played to sellout audiences in Australia and has toured extensively. Icehouse began in 1977 as a Sydney-based pub rock band called Flowers, who were the highest paid unsigned act in Australia at the time. In 1980 Flowers scored a record deal with Regular Records and released their first album, Icehouse, which received critical acclaim and reached multi-platinum status in Australia and New Zealand. It soon became the highest selling debut album in Australia. The iconic cover art for the album, featuring branches intertwined, was created by Flowers drummer John Lloyd, a former art student. After performing their song “Icehouse” at the Countdown Awards, the band was awarded with the Johnny O’Keefe Award for Best New Talent of 1980. In 1981, Flowers changed their name to ICEHOUSE as it went international in order to avoid conflicts with another group. With their new name, the band embarked on their first overseas tour, taking on the US, Canada and the UK. The singles “Icehouse” and “We Can Get Together” were released in Europe and America, and the evocative Russell Mulcahey video for “Icehouse” generated much interest. ICEHOUSE’s second album, Primitive Man, produced the classic Aussie anthem “Great Southern Land” which reached number 5 on the Australian singles charts. Primitive Man also included the single “Hey Little Girl”, a UK Top 20 Hit with Icehouse performing the song on “Top of the Pops”. The album sold over 650,000 copies when released in Australia and is a favourite in Europe and the US, where ICEHOUSE still has many fans. During this time Icehouse also supported David Bowie during Bowie’s European leg of the Serious Moonlight tour. It was the 1987 Man of Colours album, however, that made ICEHOUSE a true international success, with smash hits “Crazy” and “Electric Blue” peaking near the top of both the US airplay and sales charts. Man of Colours became the highest local-selling album by an Australian band, and ICEHOUSE’s most successful album—selling more than a million copies in Australia and reaching gold status in Canada. 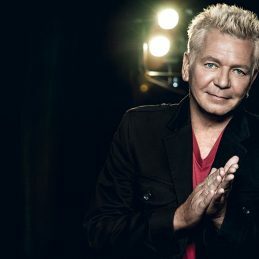 With as many as nineteen musicians who have been (or still are) members of ICEHOUSE, it is songwriter, guitarist and lead vocalist Iva Davies who is the band’s creative heart and driving force. Many of the musicians who have been a part of the band were from Australia, but several were from the UK, including bass player Guy Pratt, keyboardist Andy Qunta and Sax player/keyboardist Simon Lloyd. A famous guest artist was Brian Eno, who was featured on the 1986 album Measure For Measure. Eno had previously worked with Roxy Music, David Bowie and U2. In 2006, ICEHOUSE was inducted into the Australian Recording Industry Association Hall of Fame, being described as “…one of the most successful Australian bands of the 80s and 90s.…With an uncompromising approach to music production they created songs that ranged from pure pop escapism to edgy, lavish synthesized pieces.” In 2006 Man of Colours was still the highest-selling album in Australia by an Australian band.